Endurance sports are predicated on hope; indeed, it is practically the cornerstone of the mental aspects of sport. Hope that you can train. Hope that you stay injury-free. Hope that the weather cooperates. Hope that you can balance training with the rest of your responsibilities. Hope that you don’t get sick. Hope to overcome adversity. Phew, that is A LOT of hope. There is limited research about hope and athletics, possibly due to the focus of sport psychology on “deficits and problems” within the athlete. C. R. Snyder, a preeminent researcher in the field of hope, defined hope within the context of goal-oriented behavior as having two parts: agency (goal-directed determination) and pathways (planning to meet goals). In this framework, pathways refers to the perceptions of being able to create “workable routes to the goal” and agency as the will to begin and continue along the pathway to the goal. Clearly, the components of hope are complex, because they are comprised of a duo of interacting factors and individuals can differ in their hope across domains, such as family, relationships, work, leisure activities, and academia—meaning, for example, there can be high athletic hope, but low academic hope. Adding to the intricacy is the fact that individuals can fluctuate in their level of hope over time according to life’s circumstances (state hope), although people do fall into a general range from which they do not substantially vary (dispositional hope). 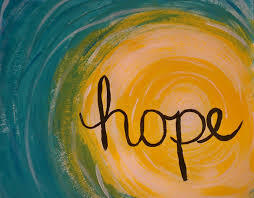 Hope is not an insignificant paradigm. It is important because “hope not only facilitates attaining a goal when that goal is unimpeded, it also helps individuals better cope when negative events or feelings arise.” Indeed, hope has been associated with higher proficiency in life, superior coping mechanisms, increased positive thoughts, less depression, and a better outlook during stressful events. I think of hope as the grains of sand in an hourglass, not in the soap opera kind of way (you know, from The Days of Our Lives), but in a more existential way. At some point your hourglass is full of hope sand. But the sand is always filtering down because hope is volatile, waiting to escape, attempting to shake your resolve, and eventually causing low hope or a total lack of hope. Luckily, even though there is always leakage of the hope sand, there is a certain amount of hope tolerance. Hope sand will spill down after a bad workout, but a single dreadful workout is usually shaken off with the hope that the next one will be better, so the top level of the hourglass is refilled with hope sand. How about when you are sick? Your hope sand will spill down quickly until you feel better and you can resume your training. Once you are well, flip the hourglass over and you have lots of hope again. Suffering from an injury makes the hope sand disappear quickly into the low hope level. But once you get ahold of the problem, the process will slow down and eventually, when you recover, you can move your hope sand away from the low hope level and you will have lots of hope once again. What happens when all of the sand filters out of the top of the hourglass and fills the bottom of the hourglass? In the summer of 2015, for the first time in my life, I had no hope sand left in the top of my hourglass. My pain became ruthless, my life utterly altered, and to compound the issue, there was no sign of a solution. I lacked hope. The lowest point, the time when all of the sand seeped to the bottom of the hourglass, was in early August of 2015. I had a consultation with the surgeon who had removed the titanium plates from my ribs that May to determine whether he could or would perform another surgery to help alleviate continued abdominal wall and neuropathic pain. The problem was that the MRI he ordered did not show any abnormalities. He did not examine me. He based his decision solely on the MRI imaging that had a very low likelihood anyway of turning up anything irregular. He was unwilling to do an exploratory surgery. I reminded him of two comments that he’d made in May: (1) he would address the neuropathy after surgery, and (2) I was now his patient, in his care, and he would follow through to help me. He did not do either. I left his office in tears, the top level of my hope hourglass completely devoid of hope sand. I was confused and seemingly out of options. My mental state was shattered and my thoughts went to some very dark places. On a whim, I called my physical medicine doctor who was always an ally, and scheduled a nerve block to help alleviate the pain until a more permanent solution was found. Luckily, the doc fit me in two days later. The relief I felt from the nerve block allowed some hope sand to find its way back into the upper end of the hourglass. The pain dissipated enough that I could think more clearly. My father did some research and found the surgeon who performed my surgery in September 2015. The moment I met this surgeon, my hope was renewed, and my hourglass refilled immediately. I instinctively knew that this doctor would be able to help me. Five weeks after surgery, I noticed some major improvements in my health and overall well-being. However, there was still some sand on the bottom of the hourglass, though, as I managed some lingering issues, namely a persistent and uncomfortable abdominal muscle spasm, sternum pain, and shortness of breath (eventually I needed two more surgeries in 2016 to remedy these problems). The Adult State Hope Scale is a tool to determine your level of hope. It can be used to measure hope for just about anything, but in the context of this book, you can use it to examine your level of hope with respect to endurance sports. If you recall from the above discussion about hope, there are two dimensions within the construct of hope: agency (will to begin) and pathways (routes to the goal). 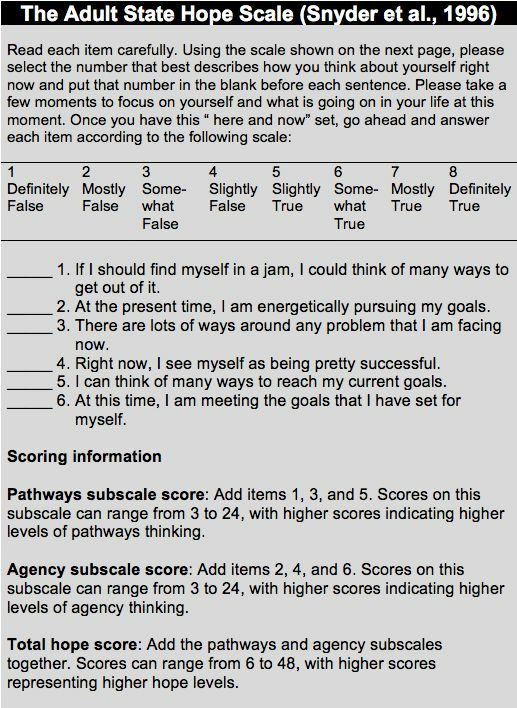 The Adult State Hope Scale measures the two dimensions, as well as overall hope. Take the test and establish your level of hope. An objective measure can alert you to an impending hope disaster before it even registers, or it can solidify that there is a hope problem that needs to be addressed. 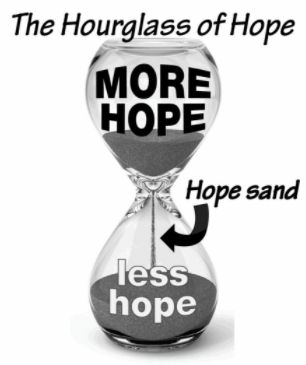 When my hourglass was overflowing with sand in the less-hope level, I was fortunate to be able to bide my time while I refilled the more-hope level. Restoring hope when it seems there is none to be had is imperative to break the lack-of-hope cycle. Because without hope, truly, endurance sports are meaningless. Reestablish hope with my suggestions, below. Family and social support. My family and friends offered more support than I could have imagined. I was very open and honest with my feelings, and being able to express my lack of hope allowed them to give me the proper consolation and help. Do your research. I knew from my reading of journal articles exactly what was wrong and what needed to be done even though MRI, CT, and X-ray imaging did not reveal the problems. Once the surgery was performed, my hunches were confirmed. Education is a powerful tool. Focus on what you can do and not on what you can’t do. Ugh, this was really hard. I took a lot of walks and hikes with my husband (and the ever-faithful dog, of course) where all I did was complain about how I would rather have been running. My grousing was not at all productive. Eventually, I embraced the walking/hiking because it was much better than sitting on my couch. Find purpose. When you are feeling hopeless, often purposelessness creeps into the picture. We all have some kind of purpose, it is just a matter of exposing it and cultivating it. My purpose was to not annoy my husband too much, accommodate the athletes I coach, write this book, and work hard for my consulting clients. Dream big, but stay within reason. When hope disappears, so do the dreams. Do not let your dreams slip away, they are important and propel you forward. As each day passes, the probability of my qualifying for the 2016 Olympic Trials marathon diminishes, but one can still dream, and it serves a dual function because it also gives me purpose in my training.